Thanks to growing oil revenues in the 1970s, Iraq had, by the early 1980s, developed a generous public services system. It was seen to have the best education system in the region, with near-universal primary school enrolment and an effective literacy programme. Had Iraq progressed at the same rate as other Middle Eastern countries, primary school enrolment for both boys and girls would be 100 percent today, according to the UN Children’s Fund (UNICEF). Instead, Iraq’s education system is largely playing catch-up. Its downfall began with the Iran-Iraq war of the 1980s, and the Gulf War of 1991. It was exacerbated by the squeeze on resources caused by a decade of international sanctions throughout the 1990s, which resulted in lower teacher salaries, higher turnover, fewer qualified teachers, less professional development, neglected infrastructure and reduced access to resources like periodicals, according to the UN Educational, Scientific and Cultural Organization (UNESCO). Government statistics show a 10 percent drop in primary school enrolment rates, from 90.8 in 1990 to 80.3 in 2000. Enrolment in Iraq’s vocational and technical schools dropped by half in the same decade. Following the US-led invasion of 2003, UNESCO reported widespread arson and looting of educational facilities, with vocational schools, for example, losing 80 percent of their equipment, according to the Ministry of Education. A 2003 assessment by the UN found that looting had affected 3,000 schools. Teacher training institutes were affected in all but the northern Kurdish governorates; libraries and colleges were looted and burned, UNESCO said. De-Baathification - the occupying forces’ policy of removing from office all officials belonging to the deposed leader’s Baath party - furthered the educational decline by triggering a brain drain in universities, it added. “Emerging evidence indicates that the third war in three decades - the US-led invasion from 2003 to 2010 - has left behind a dilapidated education system affected by safety concerns, rising costs, and acute shortages of teachers and learning materials,” the University of Pittsburgh’s M. Najeeb Shafiq wrote in a 2012 article in the International Journal of Educational Development. In the four years following the invasion, at least 280 academics were killed by insurgents and militias, IRIN report in 2007, leaving Iraq without a strong, educated elite to help the country - and the education system - recover. The impact of the 2003 invasion on enrolment rates, specifically, is less clear because statistics are inconsistent. Some, like those in the Multiple Indicator Cluster Surveys (MICS), conducted by the government and UNICEF, show an increase in net enrolment of children aged 6 to 11, from 68.2 percent in 2000 to 85.8 in 2006. Other statistics show the opposite: a massive drop from 93 percent enrolment in 2000 to 54 percent in 2006. Statistics in Iraq in general are widely viewed as unreliable, and those on enrolment differ based on children’s age groups and whether they are measuring net enrolment (the percentage of children of official primary school age who are enrolled in primary school) or gross enrolment (the percentage of children of any age who are enrolled in primary school). 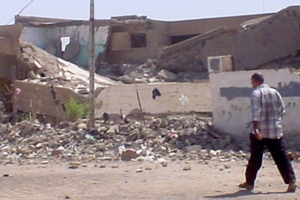 [Iraq] Destroyed school in Basra. What appears clear, however, is that Iraq is not as far ahead as it could have been. The 2011 MICS produced a net enrolment rate of 90.4 percent (among those 6 to 11 years old), just under the government’s 1990 rate of 90.8. Yet one in seven secondary-school-age children is studying at the primary level. Only 44 percent of students complete primary school on time. And while secondary school enrolment has increased in recent years, according to the MICS, less than half of students continue past grade 6. In 2007, a joint World Bank and government survey found five million school-age children out of school. In addition, enrolment rates vary significantly based on gender, social status and geographic region. And while the quality of the textbooks has improved in the past decade, and there is no longer pressure on students to join the Baath party, some degree of sectarianism and corruption has found its way into the school system since 2003, said Ali al-Hussaini, a high-school student in Baghdad. Like primary education, literacy was an important focus in Iraq decades ago. In 1978, the government launched the Comprehensive National Campaign for the Compulsory Eradication of Illiteracy, but that campaign slowed after the wars of the 1980s and 1990s. A literacy campaign launched in 2010, Literacy Initiative for Empowerment (LIFE), and a new literacy law approved in 2011 are likely to improve the rates further.